Our people have lived in Texas for over 100 years. Before that, we were in Mexico, where some of us still live, and before that we were in Oklahoma, and even earlier than that, Florida. And before that, we came from Africa. As far as we've come, in all our travels, we have never lost an awareness of our identity and a pride in our freedom, because it is our freedom which makes us different from other Americans of African descent. 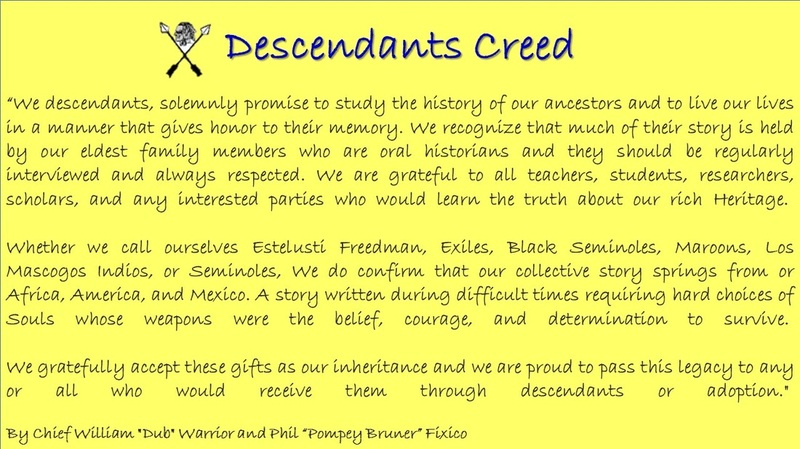 In the 17th century our ancestors fought against slavery and escaped into the northern bushlands of Spanish Florida. There we joined with our Indian brothers and sisters who had also escaped from the oppression of the European slavers; together, for many years, we resisted their attempts to recapture us. Together we rode against the white man to preserve our freedom, and together we created a Seminole society from both Indian and African roots. When we had to leave for safer territory in the 1830s to escape the slave raids in Florida, we went to Indian Territory and settled along the Canadian River in what is today Oklahoma. But slave raids continued from nearby states. In our search for peace, we left once again and went to Mexico, though some of our people stayed behind in Oklahoma, where their descendants still live today. In 1870 a few hundred of our ancestors were asked to come to Texas to fight the Native Americans so that white people could settle in the region. Those Seminoles served as Scouts for the U.S. Army out of Fort Duncan in Eagle Pass and Fort Clark in Brackettville, where we live today. 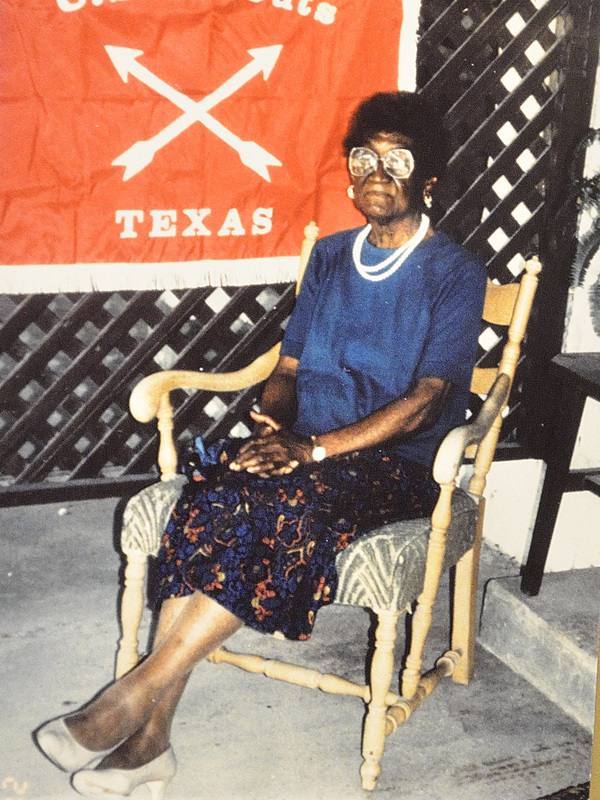 Although some of us visit our relatives in Mexico, at El Nacimiento del los Negros in Coahuila State not far from Muzquiz, we lost touch with our people in Oklahoma until 1981, when some of them visited Brackettville for the Juneteenth celebration. June 19th commemorates the emancipation of the slaves in Texas, and we celebrate it every year in solidarity with our fellow Black Americans, but it is not a part of Seminole history since we were never slaves in Texas. For more than 200 years we kept our double African and Indian heritage alive. Our language and our way of life, our songs and dancing, our philosophy and our cooking all remind us of our distinctive roots. Only since the end of the Second World War have we really begun to lose those old ways. I remember when we would pound corn in a huge mortar made from a tree trunk to prepare suffki and toll, our special dishes. I remember when everybody around us would be speaking Seminole, the children too. I remember the way we used to dress, and the kinds of homes we lived in on the grounds of Fort Clark. Today there are few of us left who know our history and speak our language. It may be that too much time has already passed to get those things back. Some of the young people leave our small community and return to Brackettville only to visit. But perhaps this recognition of who we are and what we have done may stir in their hearts a sense of pride and may move them to learn from us while they can, and they may yet pass on our story to their own children. We have given our loyalty and our skill to our country, and we have contributed to its history. I can rest now, knowing that this has been recognized at last, and that future school children, both American and Seminole, will learn about the part we have played in the growth of our great nation. This statement was originally published in the 1992 Festival of American Folklife catalogue.